Guess what! Guess what! Guess what! Guess what! 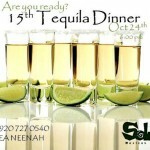 WE FINALLY MADE IT TO ANOTHER TEQUILA DINNER!!! 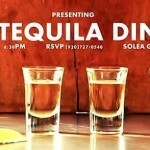 The last Solea Tequila Dinner we were able to attend was TWO years ago, so I was just a little excited for this one. Can you tell? 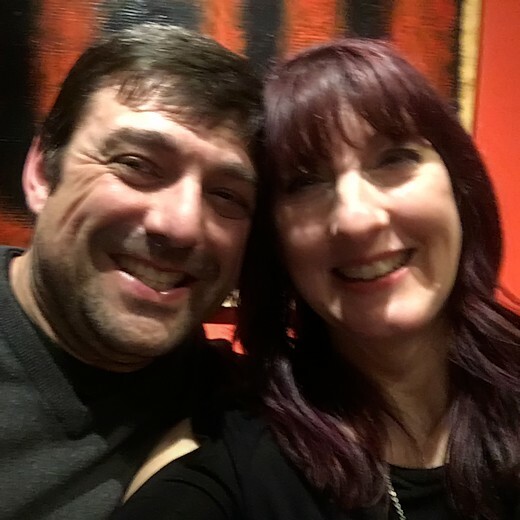 Teacher and I were really looking forward to a night of good food, good drinks, and reconnecting with friends we usually only see on Facebook. Life has been so crazy lately that our usual Date Nights have gone by the wayside and we’ve really missed the time together being a couple instead of parents, teachers, and all the other roles we play. 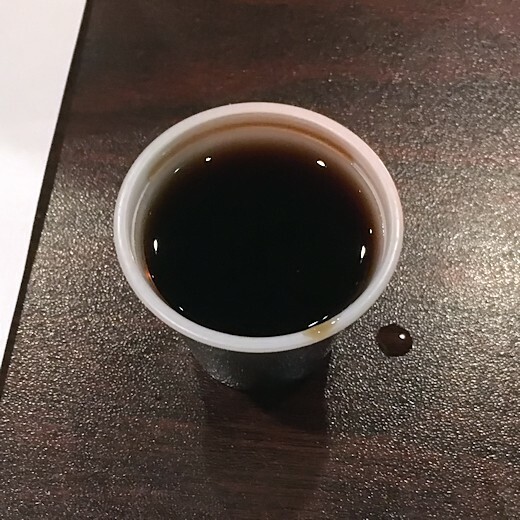 We were super early, believe it or not, and one of the waiters offered us a sample of the 1800. It’s a nice tequila – one of our go-to brands. It was nice to have a little time with just the two of us before everyone else showed up too. This year I remembered to snap a photo of the “hospitality table” before thirsty tequila aficionados attacked it. Tonight there are only four featured tequilas instead of five, because the Mojito contains rum instead of tequila. Shhh, don’t tell the tequila police! 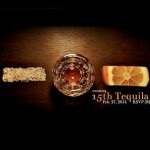 Most of the tequilas are old favorites – 1800 Silver, Patron Silver, and Patron XO Café, – but Agave Loco is new to us. I can’t wait to taste it! Pretty soon the table was full. 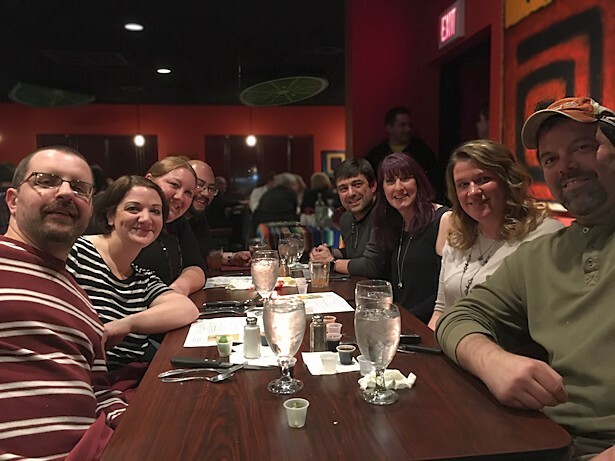 You may recognize Jim and Jessica from the February 2014 tequila dinner, and Stephanie and Jeremy from the February 2015 dinner. We didn’t know Bob and Aleana at the beginning of the night, but as I’ve said before, good tequila makes good friends. 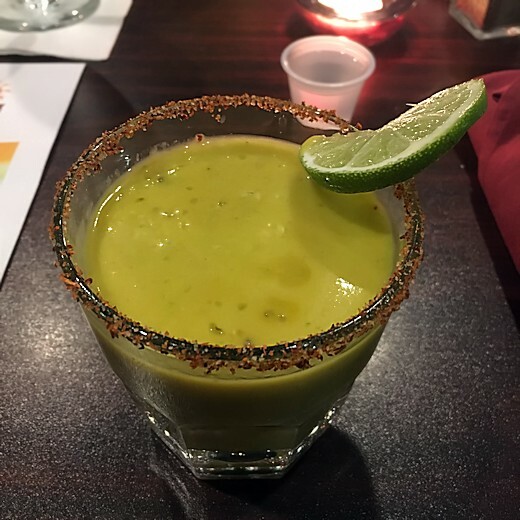 The first drink was a “Mango Avocado Margarita” made with fresh mangoes, avocado, lime juice and Agave Loco tequila. This is the most unusual Margarita I’ve ever had, which is saying something because we’ve tried a LOT of different Margaritas. The flavor was sweet and fresh, just like you’d expect from mangoes and avocados. It was just as thick as it looks, which was weird until I started thinking of it as a smoothie instead of a Margarita. Then I decided that a Mango Avocado Margarita Smoothie would make a good weekend breakfast. Yummy and healthy, right? 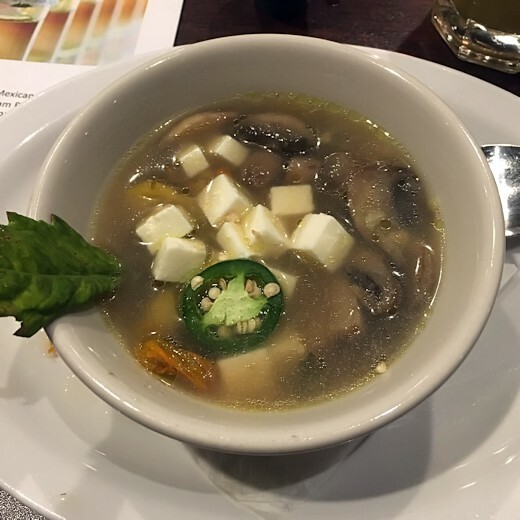 The first course was “Hongos and Flor de Calabaza Soup” with fresh mushrooms, zucchini flowers, and corn. I missed Flor when I first read the menu so I was expecting a rich and creamy pureéd soup, but obviously I was wrong. Instead, the soup was a clear broth Beef? Vegetable? Mushroom? chock full of all kinds of goodness! Even though it wasn’t creamy it was rich and comforting, and the queso fresco added the perfect amount of freshness. I’m hoping Teacher can find a similar recipe to make at home! 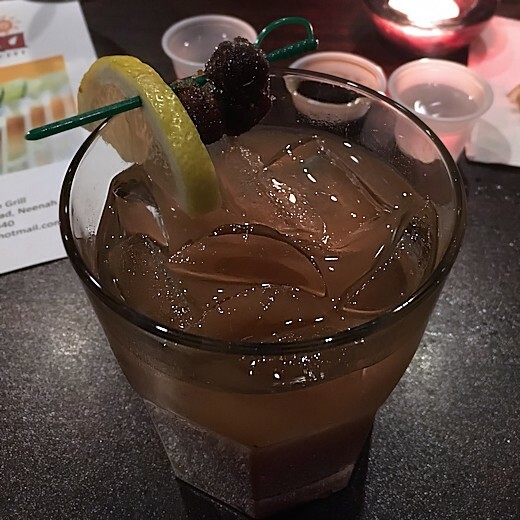 Tequila taste #2 is one of my favorites – Patron XO Café, a sweet “dessert” tequila. 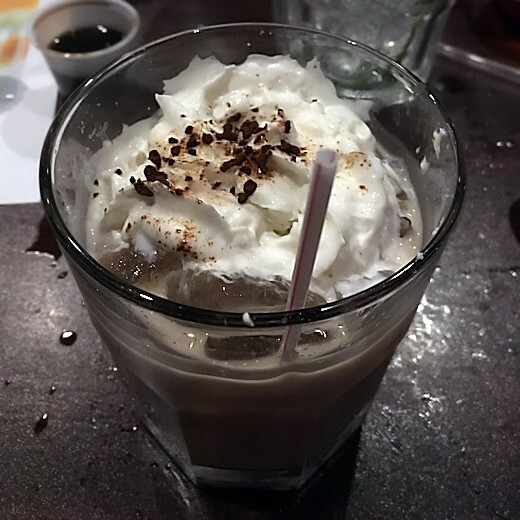 I really like this tequila, but my mostest favoritest dessert tequila is Patron XO Café Dark Cocoa, because it has coffee AND chocolate in it. The only thing that beats tequila, coffee and chocolate in my world is Teacher. He’s hands down the best. Speak of the Devil – here we are! 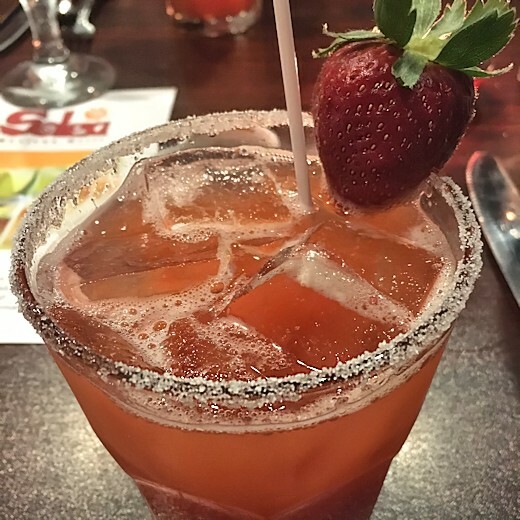 The second drink was a “Simple Strawberry Margarita” made with Patron Silver tequila, fresh strawberries, Grand Marnier and simple syrup. This was one of my two favorite drinks of the whole night! It was fruity and sweet, with a surprise – cinnamon! I never would’ve thought to add cinnamon to a strawberry Margarita, but it was amazing. 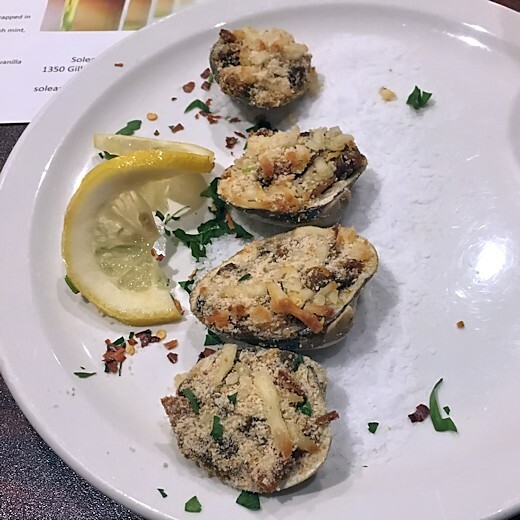 The second course was “Almejas con Chorizo al Horns” – Little neck clams with chorizo, “special house veggies” and a parmesan crust on top. I’m not always a fan of clams, but this was amazing! The chorizo wasn’t the least bit greasy I wonder if they made their own? and the clams were fresh, not fishy at all. I would definitely order this if it were on the regular menu. The soup too! One tequila, two tequila, three tequila, floor! Not really, but it’s a fun chant. 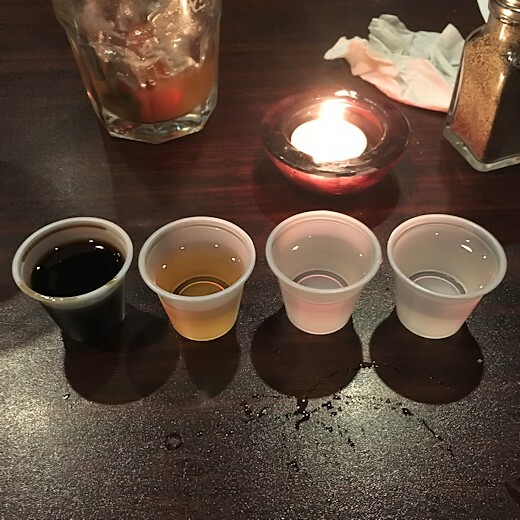 From left to right, Patron XO, Agave Loco, 1800 Silver, Patron Silver. As I said earlier, only the Agave Loco was new to us, and it was very different. Teacher and I both thought it has a fresh cucumber-y scent and flavor, although Tequila.net says it has hints of lime and salt. Either way, it’s a very fresh tequila that I’d use for summer Margaritas. 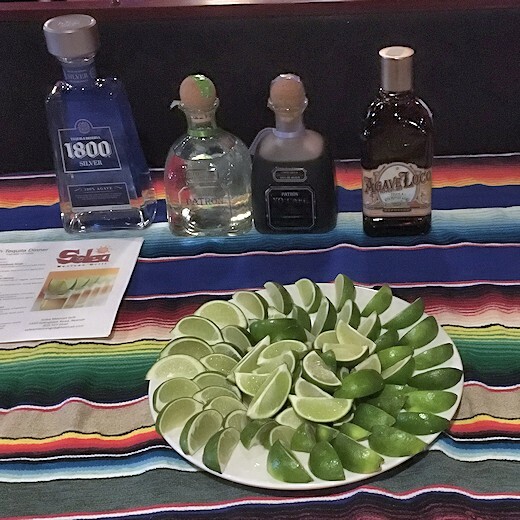 This year we liked all the featured tequilas! 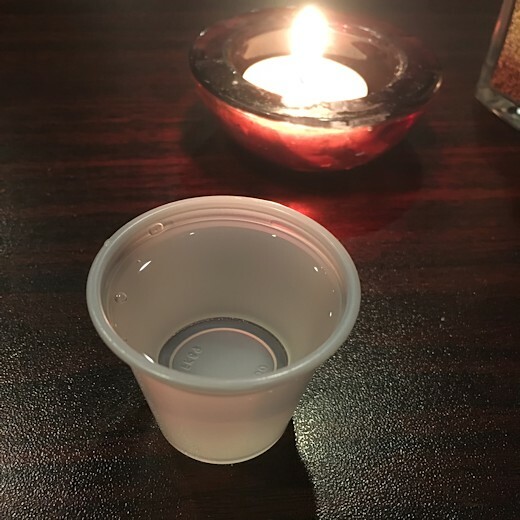 Speaking of tequila, this is the first time any of us remember that they ran out of tequila on the hospitality table and had to bring out more. I don’t know if there was a bigger group than usual or if the group was just bigger drinkers than usual. I saw them add 2 bottles of Milagro Silver – one of my all-time favorites – but didn’t see what other brand they brought out. At the end of the evening Jessica tallied them up and said the total was 12 bottles of tequila. Crazy!! The “Tamarindo Margarita” contained 1800 Silver tequila, fresh lime juice, agave nectar and fresh Tamarinds. Delicioso! Tamarind is one of Teacher’s favorite Margarita flavors, and I really like it too. This version was a perfect blend of sweet, tart, and citrus. The sugared tamarind garnish freaked out some of our tablemates, while others ate it – despite its dubious look. The look of it didn’t bother me, but I didn’t eat it either. The third course was my favorite of the evening: “Puerco en Pipian Verde” – Pork tenderloin over a Mexican molé sauce made with tomatillos, cilantro, garlic, pumpkin seeds, almonds and green peppers. It was served with garlic roasted potatoes. Holy guacamole, was this delicious! 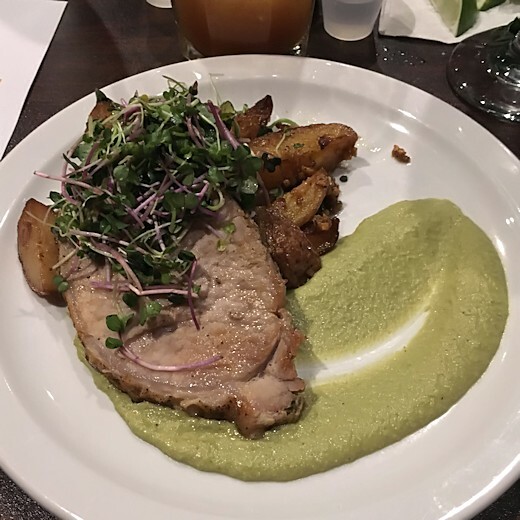 The pork was tender and juicy, the potatoes garlicky and roasted to perfection, the micro greens added a little freshness, and the sauce. Oh, the sauce. I could’ve eaten it plain. Teacher makes a pipian verde sauce with tomatillos that’s just as good – we NEED to have it on pork next time! There was a bit of a lag between the third and fourth courses. In earlier dinners the host would have entertained us with information about the various tequilas, tequila making, and Mexican cuisine, trivia questions, and noodling around on his guitar. He moved on several years ago, so this year there was a new-to-us host, and a karaoke guy. The host was super-nice and friendly, but I missed learning about the tequilas and the trivia questions. And not just because I won free drinks the past couple of times! None of us were thrilled with the karaoke. The guy had a nice enough voice and chose great songs, but it was SO FREAKING LOUD that we had to shout so the person next to us could hear. We asked them to turn it down a couple of times, but it was still way too loud. 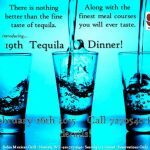 We go to the Tequila Dinner for good food, good drinks and to reconnect with friends we don’t see often, which is pretty hard when you can’t hear what anyone is saying. Luckily he didn’t sing the whole night, so we were able to converse some. 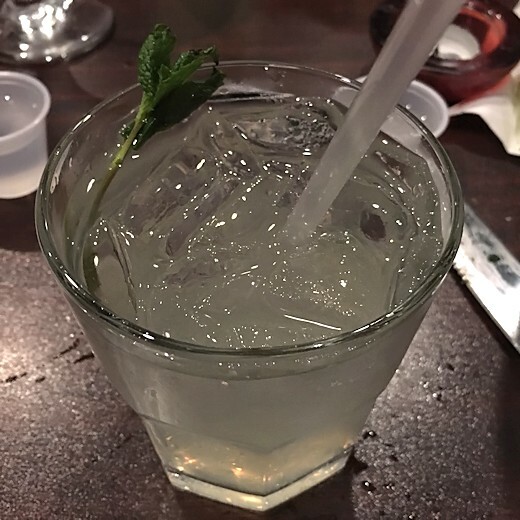 The fourth drink was a “Mojito Real” made with Bacardi rum, fresh mint, lime juice, and sugar. It was good, but to be honest I think our Mojitoes are better. Sorry Solea! 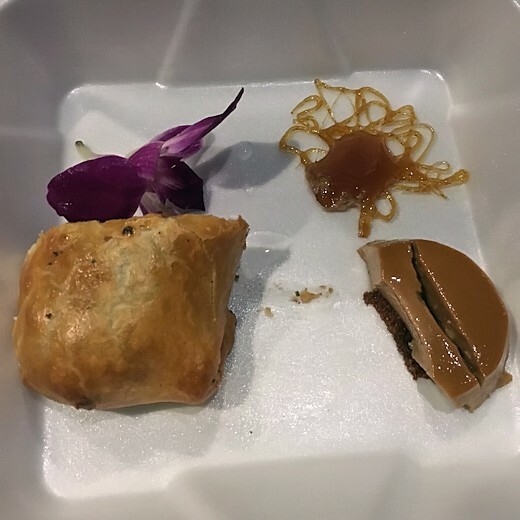 “Beef Tenderloin Mexican Wellington” – Tenderloin coated with paté, mushrooms, thyme, shallots, and tlanepa, wrapped in puff pastry. Served with green beans and an edible orchid. This was yummy, but a little disappointing too. 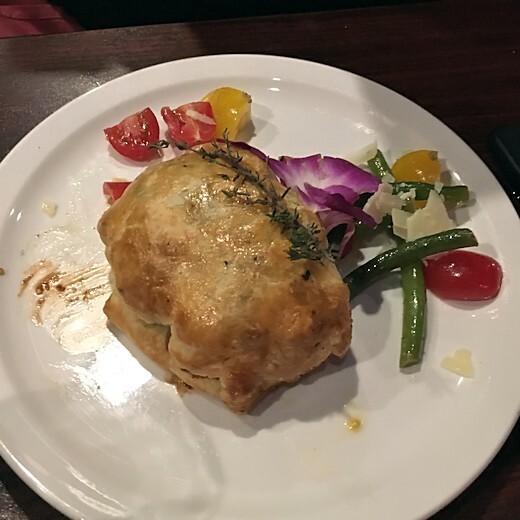 I’d never had Beef Wellington before and after watching several seasons of Hell’s Kitchen “It’s requested BLEEP pink – that’s cooked to BLEEP! It’s BLEEP barely edible!! Aw, for BLEEP sake!” I was really excited to try it. The flavor was good and the meat was tender, but I prefer my tenderloin medium-rare and with less “stuff” on it so I can really taste the beef. I was stuffed by this point so I gladly put half my Wellington into a box for Jo-Bear. Gotta keep the Designated Driver happy! By the way, a big Thank You to Jeremy, who let me photograph his Wellington after I forgot to take a picture of mine before digging in. Hey, it happens! I’m proud it only happened once this time around. And finally, dessert. 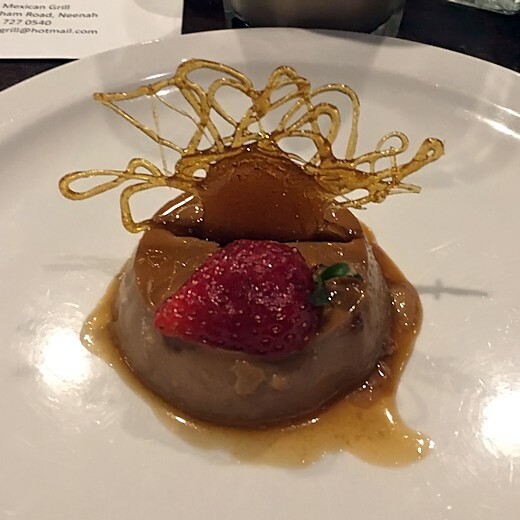 “Patron Café Flan” which was traditional flan with the sweet caramel sauce AND Patron Café tequila over the top. Oh my sweet heaven, I didn’t think flan could get better, but I was oh-so-very wrong! This was one of the best flans I’ve had in my entire life and I’ve had quite a few over the years, and the addition of the XO tequila… Genius, pure genius! 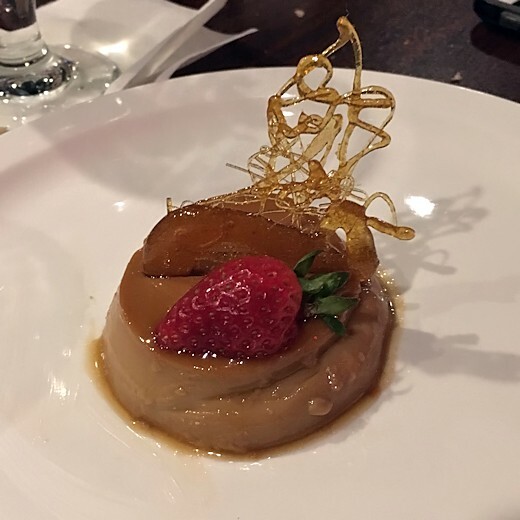 Each flan had its own decoration on top. Mine above was a sunset, Teachers looked like a duck with some decoration behind it. I was going to take photos of everyone else’s flans but they dug in too quickly. I can’t blame them. Jo-Bear had been texting me, begging us to bring flan home for him and since I was so stuffed it wasn’t funny I added half my flan to the Wellington in his “Doggie Bag.” I’m bringing small containers to the next Tequila Dinner for half of every course so I don’t get as stuffed…. And so I’ll have a fantastic lunch the next day. All too soon the Tequila Dinner was over and Jo-Bear arrived to take us home. 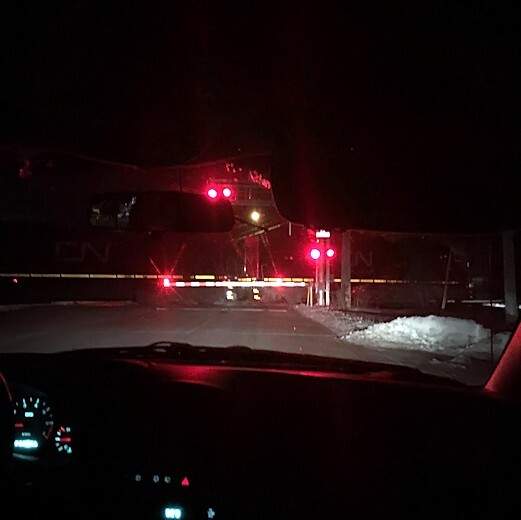 We were planning to drop Jim & Jessica off on the way, but this train had other ideas. 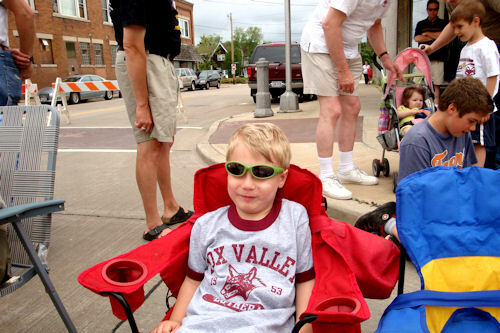 They lived just a couple of blocks away so they hopped out to walk the rest of the way home. I felt bad just leaving them there, but it was a nice night. They were posting on Facebook later that night so I knew they got home safely. When we got home Jo-Bear devoured the flan and put the Wellington in the fridge for the next day’s lunch. 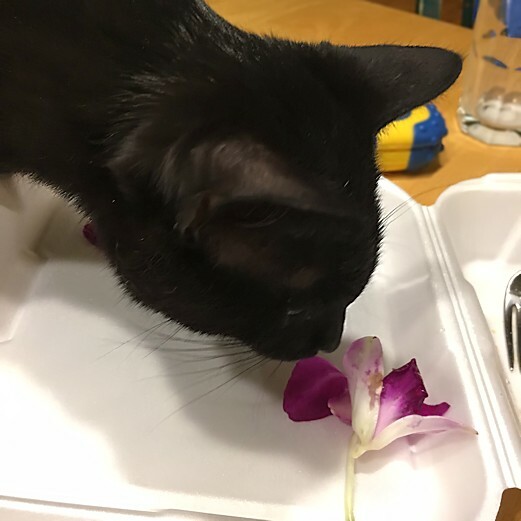 I told him the orchid was edible, and being an adventurous eater he bit off a petal. Then he spit it out again, not impressed. This intrigued Toothless, who snatched up the petal, mouthed it briefly, then spit it out. Immediately he sniffed it, snatched it up again, then spit it out again. Goofy kitten! The next day I found the stem on the floor with all the petals chewed off, so one of the cats must’ve liked it. Probably Cinder, she’s just as goofy as Toothless. And that’s the end of the 27th Tequila Dinner. Hopefully we can make the next one, which should be in 3 months. We’d love to have you join us – the more the merrier!